One of the best parts about this time of year is the great weather that comes with it, and along with that great weather comes fun outdoor activities. Personally, one of my favorite activities during this time of year is to have picnics with my children, typically at the local park. It's not only a great bonding experience, but you get to enjoy the great weather and even better food. Here are seven ways that you can make your picnic more peachy. Be Green: Most of you will know from reading some of my previous posts that I love being "green." 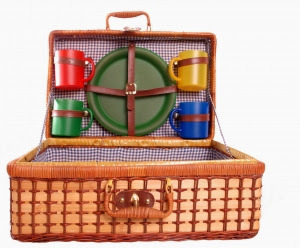 Being eco-friendly is important, and you can be in a variety of ways when having a picnic. For example, one way to stay green is to stay local. For your picnic, head somewhere that is within walking distance, if possible, or get exercise by walking or biking. This not only saves resources and reduces pollutants, but exercise is important, too! Bring some non-traditional foods: When one thinks of a picnic, they might just think of sandwiches, but when I go out for a picnic with my children, I try to have some variety. There are so many great ideas that you can go with for food, and perhaps our favorite as of late would be hummus pesto dip. Not only is it a real treat, but it's one of the more healthy options, too! Enjoy what's around you: When you're out on a picnic in the midst of great weather, it's important to appreciate it and to appreciate what's all around you. With that said, put away your mobile devices for a bit and just take it all in. Embrace and enjoy what's around you. Pack accordingly: Simply put, even forgetting one thing can put a serious dent in your picnic plans. Remember to grab all of the essentials, such as your reusable utensils (remember, be green! ), napkins, beverages, and whatever else. I don't need to mention to bring the food, right? Fun in the sun: Aside from all of the great snacks that you'll be bringing, don't forget to bring some enjoyment, too. Personally, we like to bring some books so that when we're done enjoying our tasty lunch, we can just relax in the great weather and enjoy some good books. Another fun idea is bringing a Frisbee because it's good to remember the importance of physical activity. Enjoy some music: Whether it's through your phone or some other device, plan on bringing some music to enjoy as well. However, it's important to remember to listen to your music at a reasonable level and not too loudly, as that could be inconsiderate to those around you. Clean up after yourself: It's fitting that this is the last one on the list. Remember to clean up after yourself. Don't forget to pack a trash bag so that when your picnic has come to an end, you're not leaving stray garbage all over. What is your favorite part about going on a picnic? Also, are there any other traditions or ideas that you have that you would like to share?